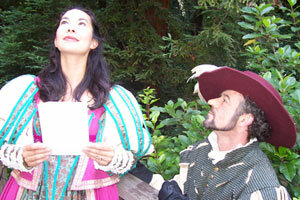 Nobody beats Cyrano when it comes to sharp wit, a pointed rapier and a heart far larger than his infamous nose. We have a reputation at Shotgun of presenting works that are considered "classics" in a fresh, bold and courageous approach. Our audience can expect no less with Cyrano de Bergerac. The actors are already engaged in stage combat training to create sword-play that will bring a thrilling sense of excitement to the production. Live violin, viola and percussion will also be integral to the performance. The reason this story is a classic is because it reminds us that true courage comes from being able to risk your heart. It is a classic because it dares us to believe that our outward appearance does not define who we truly arethat romance based solely upon appearance is merely a shadow. If Cyrano, with his gargantuan nose can win the love of the beautiful Roxanne, who dares say that love is not possible for us all? We only have to have the courage to take the risk. 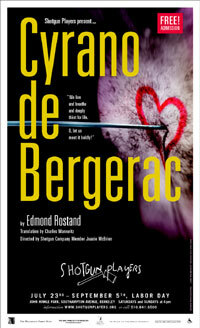 The translation used for this production of Cyrano de Bergerac is by Charles Marowitz, currently the West Coast Theater Critic for Theater Week Magazine in New York. Mr. Marowitz has published over two dozen books and has done extensive work with Shakespeare. His The Marowitz Hamlet was premiered by the Royal Shakespeare Company in 1966. Shotgun chose his version of Cyrano de Bergerac for its elegant lyrical quality; clearly this is a version that was created to be performed on stage. Shotgun Players production of Cyrano will be directed by Shotgun Company Member Joanie McBrien (Vampires). The show features an all star cast of Shotgun Core Company Members: Andy Alabran (Miser, Caucasian Chalk Circle), Eric Burns (Dog Act, Miser), Fontana Butterfield (Miser, EAT), Gwen Larsen (Travesties, Mother Courage), Dave Maier (Dog Act, Death of Meyerhold) and Clive Worsley (Miser, Death of Meyerhold) as well as Erin Carter, Jared Dager, Matthew Purdon and Gabe Weiss, with live music performed by Dina Maccabee. Scott Ludwig will design the set, and Rachel Shacher will design costumes. 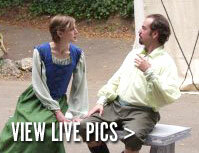 "There's No Disguising Love for 'Cyrano'"
"Shotgun Players Bring 'Cyrano' to John Hinkel Park"